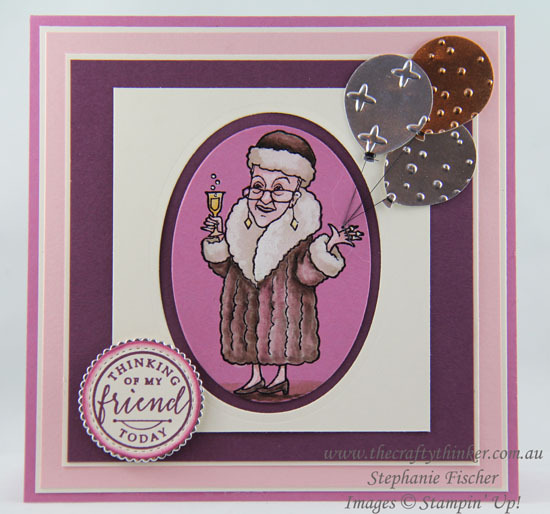 The Crafty Thinker: Stephanie Fischer - Independent Stampin' Up Demonstrator: You've Got Style, Champagne and Balloons! 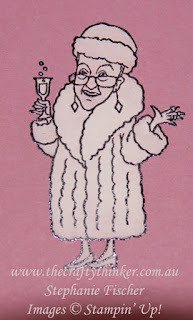 I love this quirky image of the lady in her fur coat even though I'm not sure it's entirely flattering! 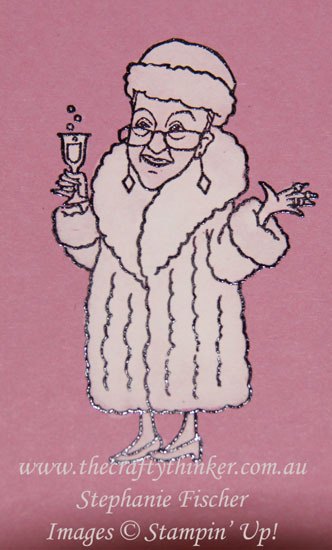 Champagne in one hand, balloons in the other - she's ready to party! 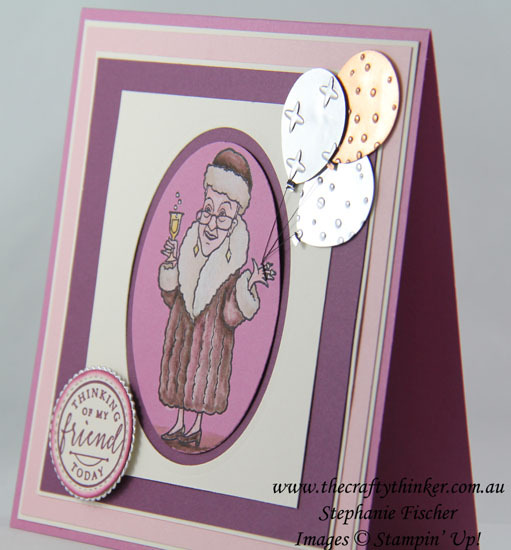 The balloons are cut from Silver Foil and Copper Foil and embossed. I tied some Black Metallic Thread around them and attached them to the hand via holes that I poked, before sticking to card front with glue dots. The greeting is attached with a dimensional. After heat embossing, I bleached the image prior to watercolouring it. I stamped the image with Basic Black Archival ink and clear heat embossed it before attacking it with an old paintbrush and household bleach. Once the bleach was dry, I watercoloured the image with Powder Pink, Chocolate Chip, Sahara Sand and Daffodil Delight inks. I added a wee bit of Chalk Marker to add some highlights to the trim on the coat and hat and then a tiny bit to highlight her skin and wished I hadn't! Ah well!